Dr. Sandra Seubert (*1968) is professor of Political Theory at Goethe University Frankfurt. Her research focuses on transnationalisation of democracy, transformations of citizenship and the shifting boundaries between public and private. She was Work Package Coordinator and member of the Executive Board in the EU KP 7 Integrated Project: “Challenge: Exercising EU Citizenship: Removing Barriers”: Barriers towards EU Citizenship (bEUcitizen), and is project coordinator of the interdisciplinary research group Structural Transformations of Privacy, funded by the VW-foundation. 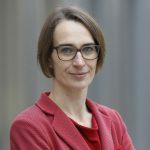 Her most recent publications include Reconsidering EU citizenship, co-edited with Oliver Eberl and Frans van Waarden and “Antinomies of European citizenship” in Juergen Mackert/Bryan Turner (eds. ), The Transformation of Citizenship, Vol. 2: Boundaries of Exclusion and Inclusion, London & New York: Routledge, 135-151.